If you have ever wondered how to change the search engine in Safari v4.0 to a different search engine, it is not that easy. In fact you need some good programming skills to actually know how to modify the only search engine in Safari, Google, in order to use another search engine of your choice. 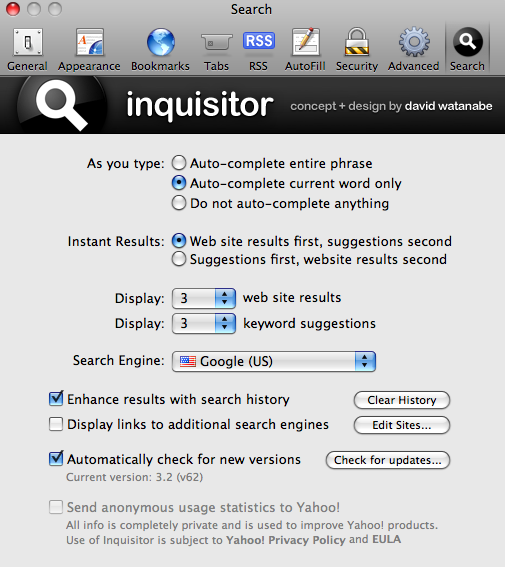 That is, until a unique plug-in called Inquisitor created by Mac software developer David Watanabe, was made to simplify the Mac user's ability to switch search engines, from Google, to any search engine of his or her own choosing. If you are in a rush to download and try Inquisitor for Safari for Mac OS X today, here is the download link below. (*) This plug-in is also available for download and installing into Firefox, Internet Explorer and also for the iPhone as a free down-loadable application from the iTunes Store. So try this little plug-in for yourself and finally enjoy the benefits of multiple search engines in Safari v4.0 for Mac today!